At Edinburgh University, the flag flew at half-mast in honour of Father John Maitland Moir, the Orthodox Chaplain to the university. His life had elements of the popularised, practical and unconventional Christianity of C.S. Lewis, to which he added layers of spirituality and asceticism. He was born on June 18, 1924 in the village of Currie in Scotland and his parents – the local doctor and patrician mother – were the crucible for the religiousness of their only child. Probably it was a frail physique that also led him to intellectual interests. He studied classics at Edinburgh then Oxford, followed by theology at Cuddesdon Theological College. He taught classics at Cargilfield Boarding School in Perthshire. He was ordained a deacon in the Scottish Episcopalian Church in 1952 and a priest the following year. His first appointment was as curate in Broughty Ferry, Scotland. He served at the Edinburgh parish of St Barnabas, chaplain to the Bishop of Moray and canon of St Andrew’s Cathedral in Inverness. Always the fervent patriot, he once earned an episcopal reprimand for wearing a kilt beneath his cassock. Over time, he became disenchanted with the Scottish Episcopalian Church, deciding it was moving away from the original Christian tradition. His interest in the Eastern Orthodox faith developed during a period of study at the Halki Theological Academy in 1950-51. 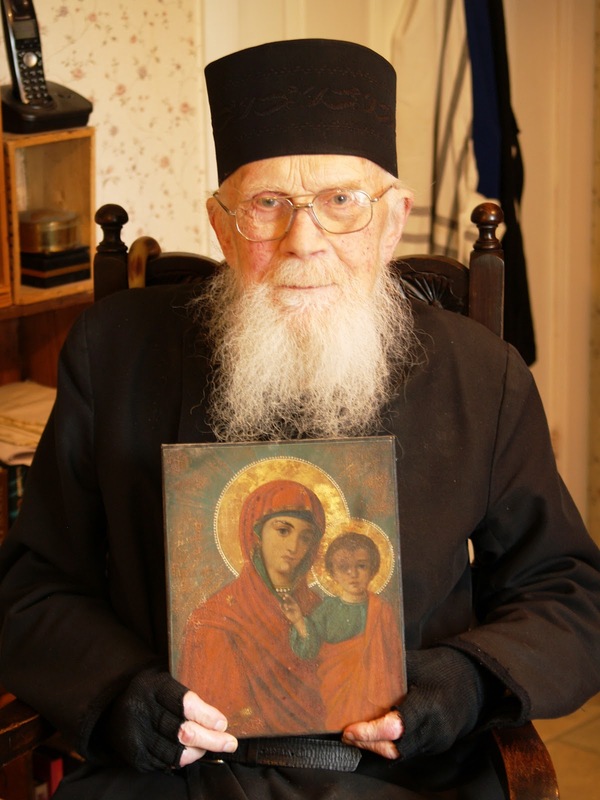 After what must have been a difficult spiritual struggle, Maitland Moir accepted the Orthodox faith at the Monastery of Simonopetra on Mount Athos in 1981. Returning to Britain, he resumed his calling as a minister and served faithfully for some 30 years, first in Coventry and then returning to Scotland. Maitland Moir was sparing in his diet and ate only one meal a day. During the strict Orthodox Lent, an exasperated cook remarked: ”Father there’s a limit to the number of ways you can cook lentils”. He ministered to the poor. He sheltered the homeless, often in his own house. He inherited considerable wealth but died penniless, through his charity to those in need. Maitland Moir established the Chapel of St Andrew in Edinburgh, first in his living room with some 20 worshippers. This flock grew and in 2003 he sold his house to buy a former school building but this also became too small. Funds to expand further were insufficient. On his deathbed, Maitland Moir gave thanks to God that his dream was fulfilled. An anonymous benefactor had come forward to complete the purchase of a £350,000 building for the community. In a world where genuine eccentricity or commitment is scarce, Maitland Moir leaves a legacy of dedication. He is survived by a diverse parish (English, Scottish, Greek, Russian, and others) under the care of Archimandrites Raphael Pavouris and Avraamy Neyman. 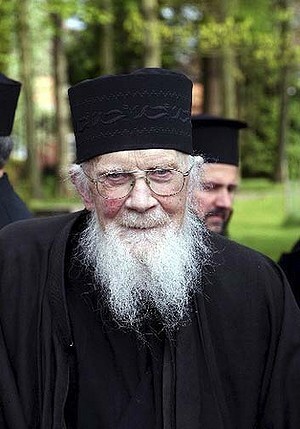 OBITUARY: ARCHIMANDRITE JOHN MAITLAND MOIR, PRIEST. He was born in 1924 in the village of Currie where his father was the local doctor; his fondness for his mother was always mingled with quiet pride in the fact that she was a member of the lesser aristocracy. The privileged but somewhat severe upbringing of an only child in this household together with a chronic weakness in his knees kept him apart from the hurly-burly of boyhood and directed him from an early age to more spiritual and intellectual pursuits. After his schooling at Edinburgh Academy, he went on to study Classics at Edinburgh University during the war years, his never robust health precluding any active military service. After the war, and a short spell as Classics Master at Cargilfield School in Perthshire, he moved to Oxford to continue classical studies at Christ Church and theological studies at Cuddesdon Theological College. His interest in Eastern Christendom was awakened in Oxford and he eagerly seized the opportunity to study at the famous Halki Theological Academy in Istanbul in 1950-51. During this year he also travelled in the Holy Land and Middle East and forged friendships in the Eastern churches which he maintained throughout his life. On his return to Scotland he was ordained in the Scottish Episcopalian Church, which he was to serve faithfully for the next 30 years. His first charge was as curate at St Mary’s in Broughty Ferry, then for a period of six years he taught at St Chad’s College, Durham. He returned to Scotland in 1962 as curate in charge of the Edinburgh Parish of St Barnabas and as honorary chaplain at St Mary’s Cathedral, then in 1967 he moved north to the Diocese of Moray where he served as chaplain to the Bishop of Moray and latterly as Canon of St Andrew’s Cathedral in Inverness. 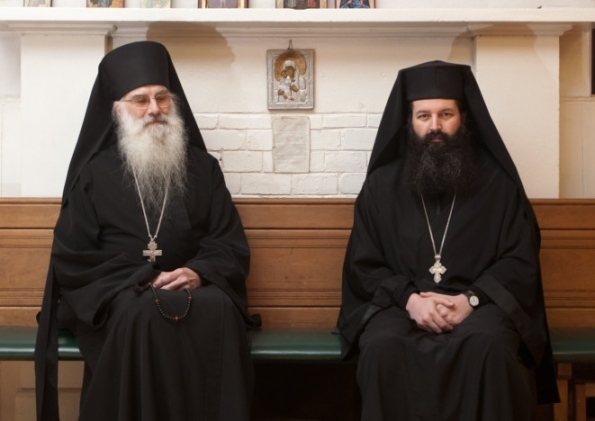 In 1981, he resigned from his position in the Diocese of Moray and travelled to Mount Athos where he was received into the Orthodox Church at the Monastery of Simonopetra. 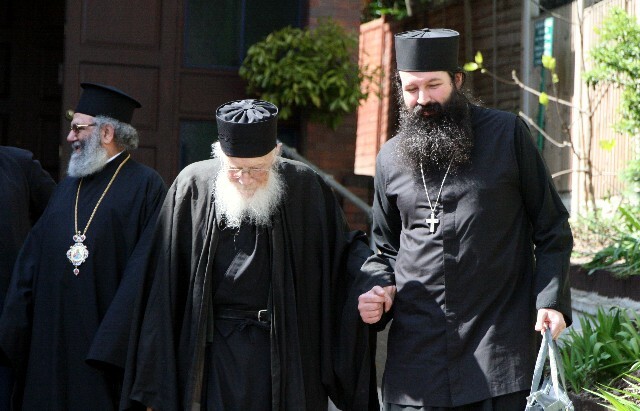 He returned to Britain to serve now as an Orthodox priest in the Greek Orthodox Archdiocese of Thyateira and Great Britain with utter devotion for a further full 30 years. 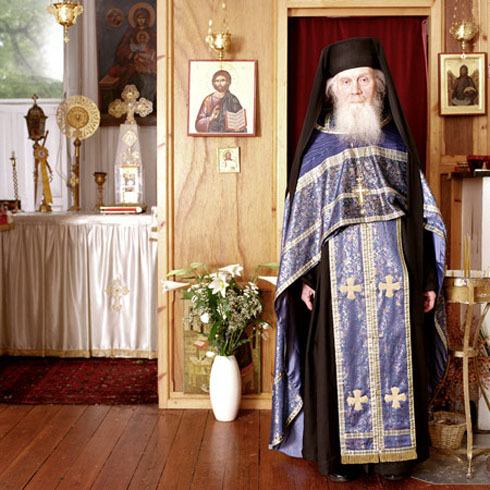 After three years in Coventry, Father John returned to Scotland where he united the two small Orthodox communities in Edinburgh, one Slavonic and one Greek, into the single Orthodox Community of St Andrew. At the same time, he travelled tirelessly around the country by bus, serving often tiny groups of Orthodox Christians in Aberdeen, Inverness, Perth, Dundee, St Andrews, Stirling and elsewhere. For Father John, the Orthodox Church was what his beloved C S Lewis would call “mere Christianity” transcending the bounds of nationality and language and embracing all who seek to live a Christian life – the scandal of the cross and the glory of the resurrection. It also embraced for him the most precious elements in the Christian history of Scotland, especially that vision of Christianity expressed in figures such as St Columba and St Cuthbert. An ascetic by nature, his interest was in a practical Christianity nourished by prayer and tradition, rather than in the aesthetic refinements and intellectual gymnastics that attract many Westerners to the Orthodox Church. Not without opposition from members of his flock, Father John introduced English as the common language of worship and succeeded in creating a truly international community reflecting the many nationalities of the Orthodox students studying at the Scottish Universities and of the Orthodox families living and working in Scotland. As the Orthodox Church in Scotland grew in numbers through migration from traditionally Orthodox countries, so did the proportion of Scottish members who found themselves at home in the community. His role as chaplain to the University of Edinburgh was one he took very seriously. The Chapel of St Andrew, set up at first in his house in George Square and then transferred to the former Buccleuch Parish School by the Meadows, lay at the heart of the university complex; the daily services held there with unfailing regularity and its ever open door provided and continues to provide a firm point of reference for countless students. The Chapel of St Andrew, however, was also the base for his work at the other Edinburgh universities and throughout Scotland – work now being continued with equal zeal and selflessness by two gifted priests, Father Avraamy and Father Raphael. Father John subjected himself to an almost unbelievably austere ascetic regime of fasting and prayer, while at the same making himself available to everyone who sought his assistance, spiritual or material, at all times of day and night. His care for down-and-out people in Edinburgh provoked admiration and no little concern in many parishioners who would come to the church, which was also his home, only to find him calmly serving coffee with aristocratic gentility to a bevy of homeless alcoholics or to find a tramp asleep on his sofa. He was tireless in his efforts to help the victims of torture and Christians throughout the world who were persecuted. Few days would pass without him writing a letter of support for someone in prison or in mortal danger. He had inherited a comfortable fortune but he died penniless, having dispersed all his worldly assets to the deserving and undeserving in equal measure. His habits of life would have marked him as a caricature of Scottish parsimony had they not been joined to an extraordinary generosity of spirit. All his voluminous correspondence was meticulously hand-written on scraps of recycled paper and dispatched by second-class mail in re-used envelopes, whether he was writing to dukes and prelates or to the indigent and distressed. For many years, he was a familiar sight on the streets of Edinburgh as he passed by on his vintage electric bicycle, his black cassock and long white beard furling in the wind. 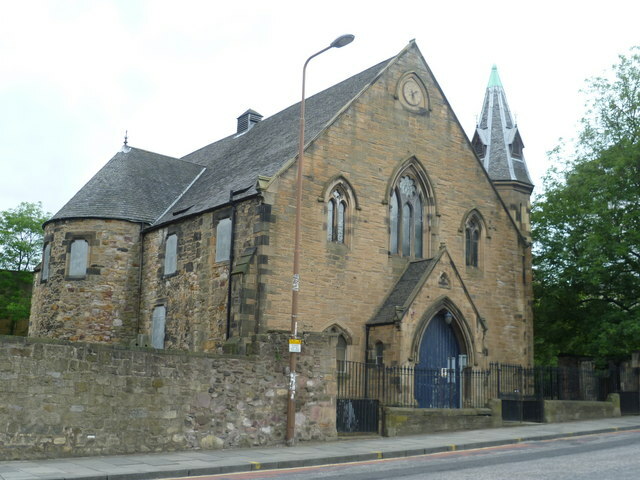 On the day he died, an anonymous benefactor finally sealed the purchase of the former Buccleuch Parish Church for the Orthodox Community of St Andrew in Edinburgh thus securing a material basis for the realisation of the spiritual vision that had inspired Father John throughout his life. May his memory be eternal!